The Magic Hutch: Easin' Into the "Seasin"
I wanted to do a table with the theme of falling leaves, emphasizing the colors of gold, brown, orange and bright yellow. But....our climate has just not cooperated. Where we live, this time of year is beseiged with HOT winds and blowing dust and the only leaves that fall are still green and were just unlucky to be hit with a gust of wind that catapulted them to the ground on the limb of an injured tree! So, trying to reproduce the fall where I grew up (in NY) is almost impossible to do. But, Halloween and Thanksgiving WILL arrive despite the weather, so I thought I'd just ease into the changing season with muted fall colors and some accents that pay homage to the fall I remember from my childhood. In my mind, I'd be having a fall lunch (with all the windows and French doors opened!) of Cesar Salad, a selection of cold cuts and cheeses, a selection of breads, sides of pickles and olives, and sliced fruits. Since we would have had such a sensible lunch, our dessert would consist of Double Fudge Brownies with ice cream and tea or coffee. Can I save you a place at the table? 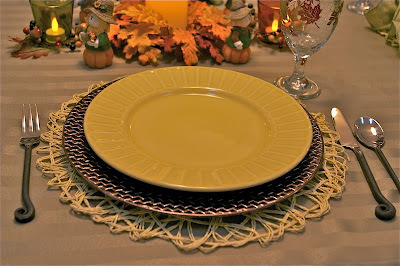 Then I added my basket-weave charger from Michael's that I have shown in previous posts. This yellow plate is from Home Goods and is labeled Metaceramica from Portugal. It is the same brand as the white plates I bought for my inventory when I first started to tablescape. On top of this, I placed a fall plate from Hobby Lobby. There is no pattern name, just Fall 2013 Table Top. 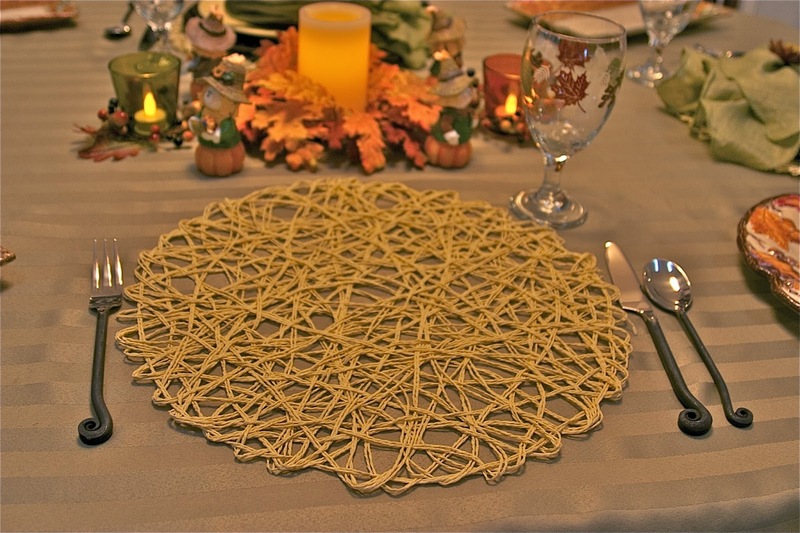 When I found these napkins and napkin rings at Pier One, I had no idea what I could coordinate with them. I just knew I liked the colors (green is my favorite!) and that I was compelled to buy something because our Pier One was moving two storefronts down and having a HUGE clearance sale (almost 70% off EVERYTHING!) Honestly, could I have left empty-handed?! Was I excited when I saw I could use them for this post, and especially glad that they went so well with my new salad plates (the flower is almost an exact match!) I completed the look with my Treble Clef pattern flatware from Old World Market and goblets from Dollar Tree. 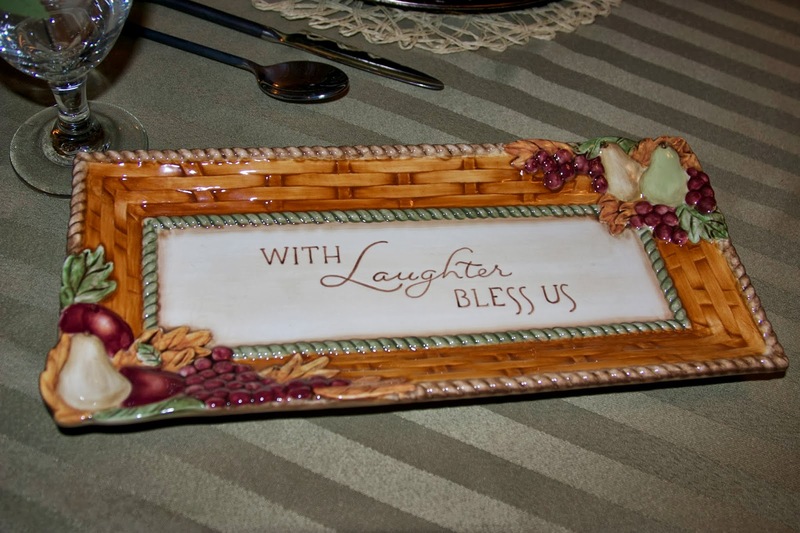 I was delighted I could showcase these serving platters in this post. My husband and I were visiting Knott's Berry Farm in Anaheim, CA years ago, and I spotted this trio in the gift shop. They are labeled Grasslands Road, nested tray set. 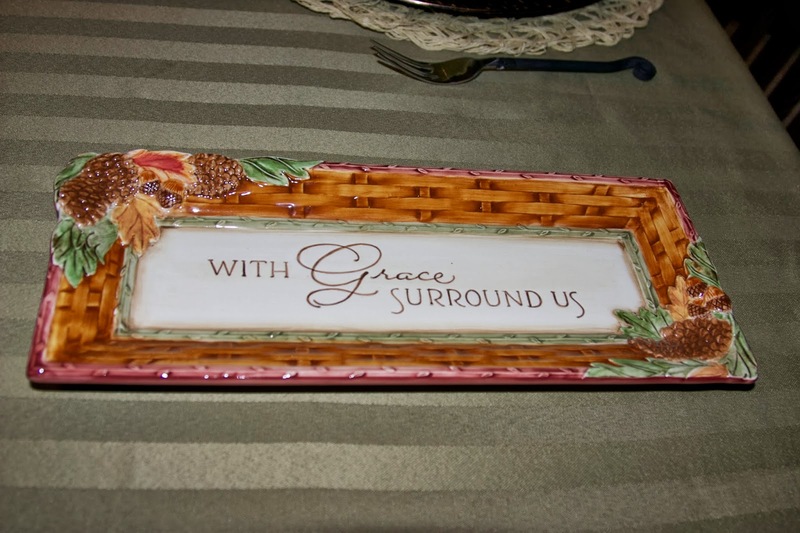 He totally surprised me by purchasing the set, and it is now an important part of my Thanksgiving decor. Yes, HE and THE SET are keepers!! 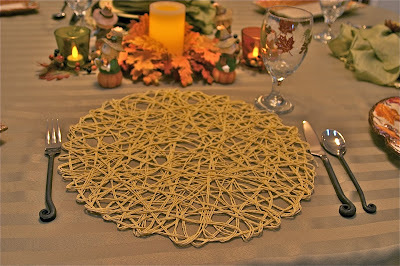 I kept my centerpiece simple, since this would be a lunch. So, I have my votive candle holders from Dollar Tree and a flameless candle from a set my husband got me while at Costco! The scarerow figurines are from Dollar Tree, and I thought I 'd give one to each of my guests as a "luncheon party" favor. 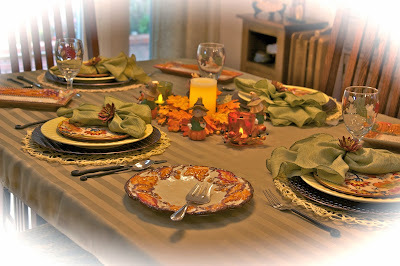 So, with this table and lunch, I'm "easin' into the 'seasin'" of fall, as much as I can until the weather turns cooler. I hope everyone out there is making an easy transition into this busy time of year. It sure does get here fast!! Lovely table with all the gorgeous colors of fall. 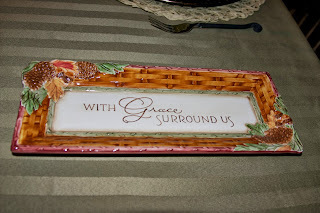 I have those same napkin rings and love them, too! I need to pull mine out soon. 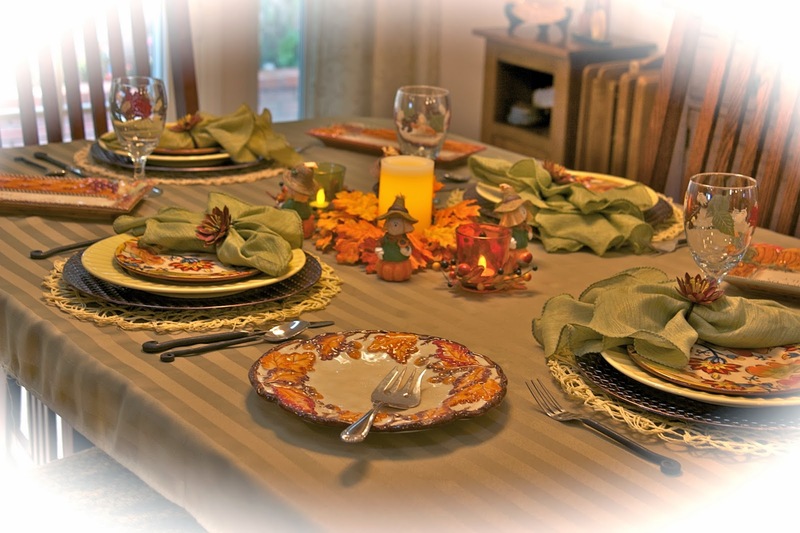 Your table came together beautifully! We are finally having some cooler temperatures here in central Texas, but alas, we don't get much fall color. Thank you for taking the time to comment, Tricia! Beautiful table! 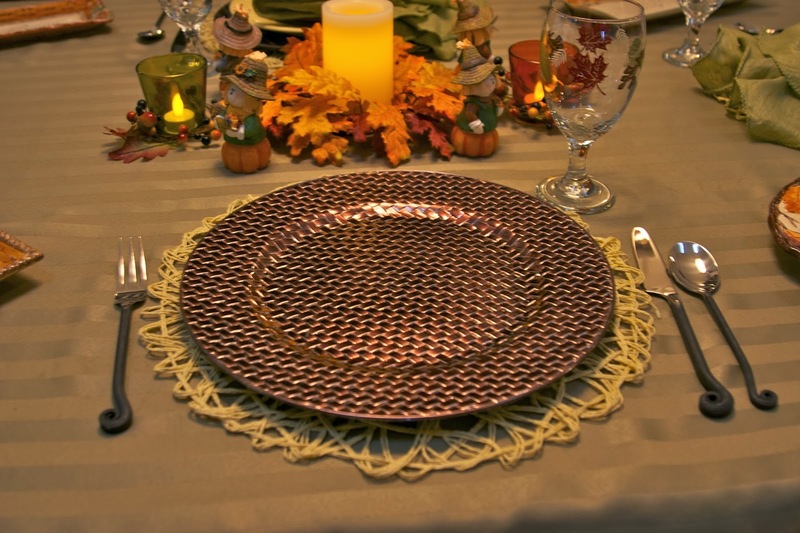 I love those pier 1 plates. 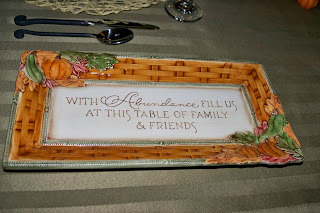 Nice to find a fellow blogger into tablescapes. 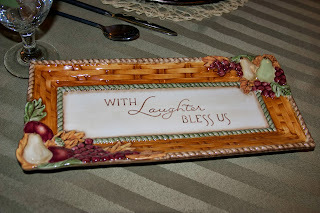 My main collection is vintage tablecloths, but that leads to dishes, candlestick holders...well you know, lol! Lovely table...the salad plates are so pretty. I am another that loves green anything! You got a great deal on the napkins/napkin rings. 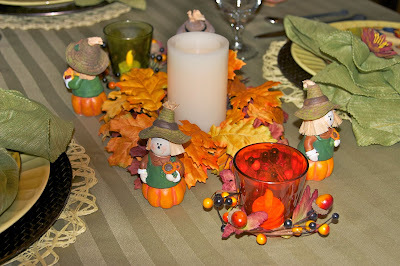 Truly a lovely Fall table! Is this your first time at Let's Dish? If so welcome. Be sure to visit as many as you can. We are a small, but very supportive group. Hope to see your beautiful tables again! Ah! I just remembered you Rosie! You did an apple scape. Glad to see you back! What a great fall tablescape! Wondering where you are located that you are missing a New York fall! It's beautiful here in Utica...trees are turning and it's chilly at night but warm during the day. So far, so good! Where did you grow up? Thank you for your kind comments, Deb! I am from New York currently living in Illinois and moving to Houston! I miss NY a lot and hope to move back there one day. I disliked winters but loved the rest. I think your table is beautiful! I love your plates! 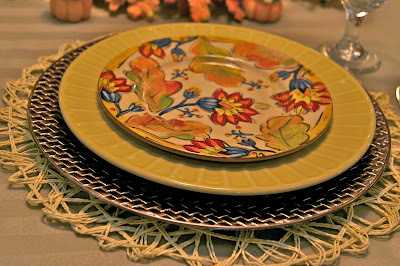 You set a great fall table.....I especially love your three serving trays. 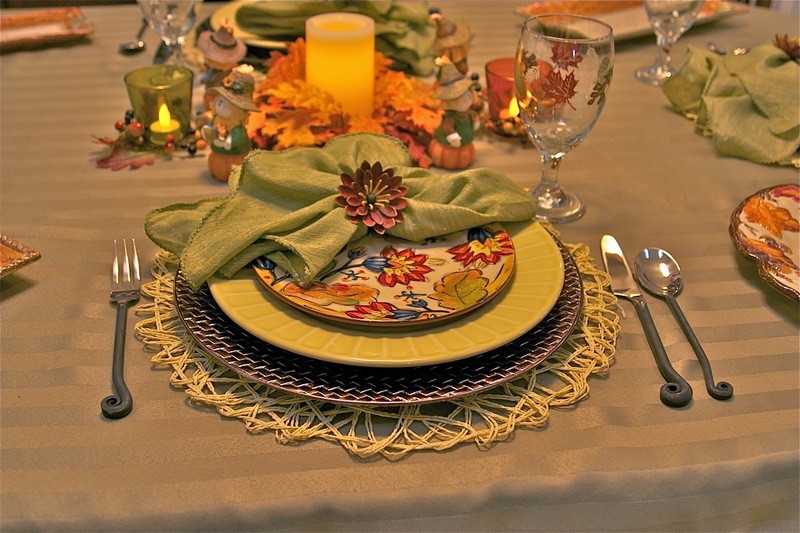 Beautiful "Indian Summer" tablesetting. Love the green! I have those napkin rings and love them so much I group them together when not in use into a red/gold pottery bowl for display and they look fabulous just sitting on the small table under a painting.